At Adidas’ 747 Warehouse St. event during 2018 NBA All-Star Weekend, The Undefeated’s Aaron Dodson caught up with Los Angeles Sparks two-time MVP Candace Parker and six-time All-Star James Harden of the Houston Rockets. This two-part series will highlight the connection both players have to Adidas. LOS ANGELES — In the streets of Los Angeles, there’s nothing but love and respect for James Harden. Just ask Nipsey Hussle, one of the city’s most respected rappers. Fresh off the stage at the Hollywood Palladium, where he’d performed tracks from his recently dropped Victory Lap, Hussle bumped into Harden, the face of the Houston Rockets franchise and front-runner for this year’s Maurice Podoloff Trophy, presented annually to the league’s most valuable player. The random run-in turned into an impromptu family reunion for Hussle, who hails from the Crenshaw area, and Harden, who’s from nearby Compton. The way the two chopped it up, you would’ve thought they were cousins. “The n—a that broke the NBA record for the highest m—–f—ing contract ever went to Audubon!” said Hussle to a swarm of paparazzi, with his arm draped around the hooper’s shoulder. The MC referenced the richest contract extension in NBA history: a four-year, $228 million deal that Harden signed last summer. But Audubon? “Y’all don’t know what that is!” Harden joked to the people behind the flashing cameras. For him, though, that word means a lot. Audubon Middle School, in Hussle’s ’hood of Crenshaw, is one of the NBA superstar’s alma maters. So when Harden returned home to L.A. for All-Star Weekend, during which he dropped his new signature Adidas sneaker, it was only right that he paid homage to the school where it all began. As a starter in the All-Star Game, the 6-foot-5 shooting guard took the hardwood at the Staples Center wearing his Adidas Harden Vol. 2s in the “Vision” colorway, a design inspired by Audubon’s school colors but remixed to incorporate different shades of green and a glitched palm tree pattern. The shoe dropped exclusively at Adidas’ All-Star Weekend pop-up, about 8 miles from his old middle school. The day after bonding with Hussle over Audubon, Harden made an appearance at the Adidas event, where folks awaited the moment they’d be graced by the presence of what was billed as a “special guest.” As Harden stepped foot on a basketball court primarily populated by kids from the city’s neighboring communities, the crowd went nuts — rushing from the bleachers and circling him, prompting the DJ to drop Playboi Carti’s 2017 smash hit “Magnolia” — and of course the Snapchat videos started rolling. The track and atmosphere commenced a Milly Rock battle between Harden and a few of his fellow L.A. natives, as he swayed back and forth in a fresh pair of his new kicks, which are engineered with FORGEFIBER and full-length BOOST technology tailored to his one-of-a-kind footwork and ability to change direction on the court. In this moment, Harden donned the burgundy “Ignite” colorway of the Vol. 2s, but the crowd favorite was certainly the vibrant “Vision” look, worn by countless children who surrounded him. The salmon-tinted “California Dreamin’” colorway also debuted during All-Star Weekend. After leaving Audubon, Harden attended Artesia High School in Lakewood, California, where he emerged as a five-star recruit and McDonald’s All-American. He starred at Arizona State University for two seasons before the Oklahoma City Thunder selected him with the third overall pick in the 2009 NBA draft. Since 2012, when a trade sent him from Oklahoma City to Houston, he’s become a six-time NBA All-Star and three-time first-team All-NBA selection, and for the past three seasons he’s been knocking on the door of becoming an NBA MVP. In 2015, Harden’s personal brand became so big that Adidas lured him away from an endorsement deal with Nike by offering a 13-year, $200 million contract. 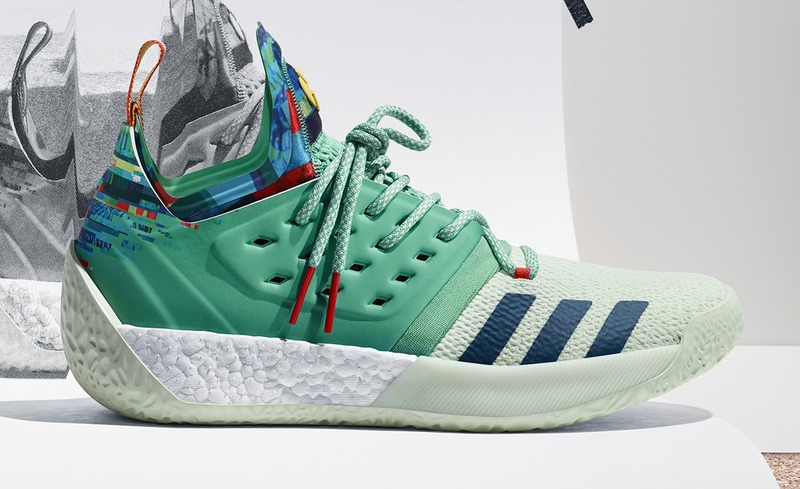 Less than three years after committing to the brand, Harden is already one of the faces of Adidas Basketball, now in his second signature shoe. As for whether this one, the Harden Vol. 2, will help him capture the elusive MVP award? Not too bad for an L.A. kid from Audubon.